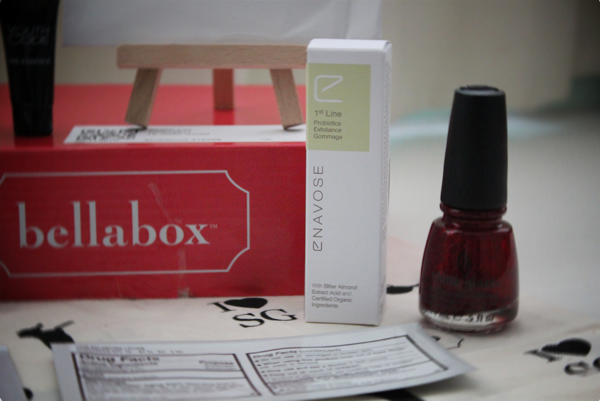 This month's Bellabox landed on my laps yesterday evening. I was pretty excited to get it because Yvette received an Anna Sui eyeshadow in hers. But alas, it was not meant to be mine! Nevertheless,I'm still pretty satisfied with my box (Though I don't think it justifies the increase in price...). 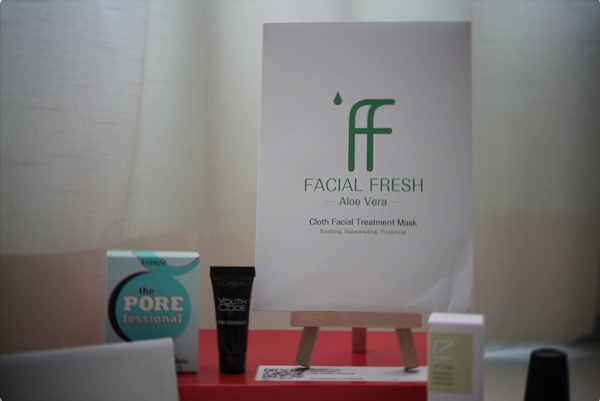 Facial Fresh's Aloe Vera Treatment Mask soothes, rejuvenates and protects, leaving the skin silky soft all day. The instant cooling effect will calm irritated and sensitive skin. The cloth mask sits in a precise dose of fresh concentrated serum of clinically-proven antioxidants, vitamins and botanical extracts. Facial Fresh Treatment Mask (Aloe Vera) at $8.95. Enavose makes another appearance with its Probiotics Exfoliance Gommage. This gommage, which is a highly effective and gentle form of exfoliation (Read more about it here. ), is formulated with a mild enzyme called Bacillus Ferment. It removes dead skin without causing stress to the skin through its resurfacing action, leaving the skin softer and smoother. It also helps in the absorption of your serums and moisturizers. Enavose's Probiotics Exfoliance Gommage, 80ml at $35. China Glaze also makes her second appearance with Wizard of Ooh Ahz Collection's Ruby Pumps. This is one of my favourite nail polish and I'm 3/4 into my current bottle so I'm real glad for this! China Glaze's nail polishes, 15ml at $15. Benefit's Porefessional is a balm that helps minimize the appearance of pores. Translucent and oil-free, it can be worn alone, under or over makeup. Benefit's Porefessional, 22ml at $48. L'Oreal Paris' Dermo-Expertise Youth Code Boosting Essence smooths and softens yours skin with just one drop. It also aids in the absorption of serums and moisturizers. In just a month, you can expect to see skin that's rejuvenated, youthful and radiant. L'oreal Paris' Dermo-Expertise Youth Code Boosting Essence, 30ml for $39.90. Elizabeth Arden's Visible Difference Skincare is 'a spa-inspired, regimen-focused essential skincare line that helps balance skin to reveal its natural health and radiance'. I was given sachets of the Skin Balancing Exfoliating Cleanser, Optimizing Skin Serum and Skin Balancing Lotion (Sunscreen SPF15). Elizabeth Arden's Skin Balancing Regimen for Combination Skin from $42 to $96. 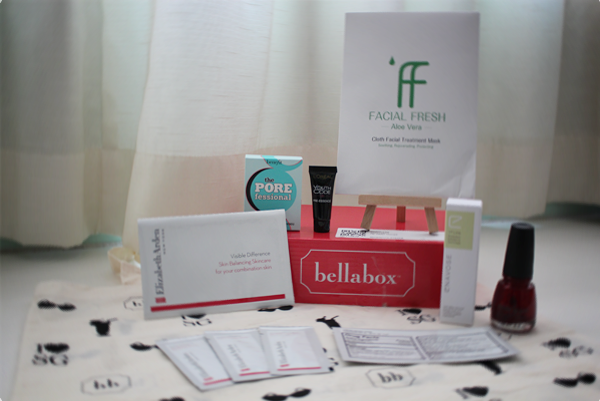 Anyway, I don't know about you but it is always 'nerve-wrecking' getting my Bellabox. When friends start tweeting and instagram-ing their boxes, I'm like 'Where's mine? Where's my shipping info?!?'. Haha. I guess the element of surprise that the box brings makes me just that little weeny bit anxious (Little weeny? Really, Charlene?). Haha. I think it would be good if Bellabox just updates our membership accounts with our shipping information, so we can just log in and check whenever we want. Makes sense? Or maybe I'm just being really fussy... But yep, my two cents' worth. Have a Toasty Thursday!